Frank J. Larkin’s career spans many diverse roles in service to our country. 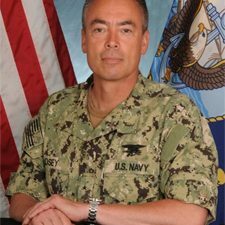 He’s a veteran of the U.S. Navy who served as a special warfare operator in the Navy SEALs, he worked in law enforcement as a police officer, detective and paramedic, and he also served for more than two decades in the United States Secret Service. 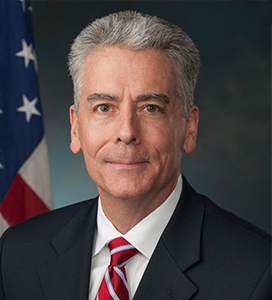 More recently, Mr. Larkin served as the United States Senate Sergeant at Arms, and lead the Joint Improvised Explosive Device Defeat Organization (JIEDDO) within the Department of Defense. Having experienced the impact of military trauma both personally and professionally, Mr. Larkin is committed to improving veterans healthcare and will Chair our Veterans Advisory Council in 2019 to support the advancement of veterans brain health. Since 1914, more than 100 years following the introduction of high explosives on the modern battlefield, we are still handicapped in our ability to diagnose the consequence of battle and exposure to blast. 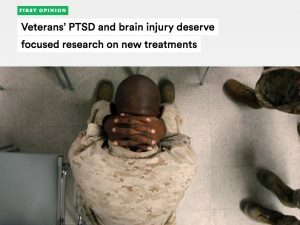 The recent discovery of a new pattern of microscopic level of brain injury, related to military blast exposure is calling into question our past approach for treating the poly-trauma effects of PTS, TBI, moral injury and use disorders. Presently, this pattern of microscopic blast TBI can only be qualified in post-mortem examination. There is an urgent need to develop reliable diagnostic imaging and blood markers for TBI in a living person. Early identification of this injury manifestation and disease evolution is necessary to effectively treat the underlying brain injury that may be complicating the treatment of other combat related conditions, such as TBI, moral injury, use disorders and the nexus to suicides. The historic course of action for treating these abnormal presentations has defaulted toward psychiatric or behavioral health focused disorders and treatments that have largely incorporated the use of mood stabilizing medications. We urgently need to confirm or deny the presence of TBI in order to accurately characterize the variables challenging the veterans we are seeking to help. Cohen Veterans Bioscience is focused on leveraging strict scientific peer reviewed processes to further knowledge of the diseases and injuries that challenge our veteran community. The national emphasis on caring for our wounded warriors has seen the emergence of many support programs and therapies. Few of these veteran directed solutions have had any serious level of scientific rigor applied to them to qualify or validate whether they are effective in their claims. As a stand alone non-profit entity, CVB is on a neutral platform to provide an unbiased assessment of these programs. Many of these programs have compelling anecdotal examples of success in helping both active duty and veterans in need. The veteran in serious need of assistance is challenged either by a lack of visibility or knowledge about programs that have been either proven effective or ineffective. More often that not, a recommendation from a buddy or teammate guides many veterans to these program referrals. Struggling veterans and their families are emotionally vulnerable as they seek solutions. CVB’s effort to identify and confirm scientifically validated treatment and support programs reduces the risk that one of these active duty warriors or veterans goes down the wrong path. Veterans in desperate need cannot afford to trade off valuable time to effective care, not to mention being able to afford the high expense associated with many of these programs. CVB’s attention to high scientific standards and evaluation methodologies can offer many of these promising programs the formal validation that will reach the high bar of trust and confidence for our veterans. 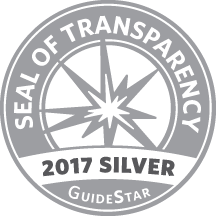 Public and private organizations, along with government agencies would be able to leverage metrics for program or treatment validation. It would lead to more appropriate referrals for our veterans and further enhance collaboration for data collection and analysis. The effort that Cohen Veterans Bioscience has underway pursuant to the recent DoD grant to study pharmaceuticals that have clinical efficacy for treating PTSD is significant. So many of our active duty warriors and veterans diagnosed with PTSD, TBI, moral injury, pain and use disorders have been prescribed a long list of drugs predominantly prescribed to treat symptoms, not the root cause of their problem. It would be irresponsible to state that all pharmaceutical therapies are bad. Truth be told, providers not completely qualified to evaluate therapeutic effectiveness or consequence, have prescribed many drugs without any sense of application. Pharmaceuticals have provided life stabilizing and life saving options for many challenged by disease and abnormal physiological or psychological conditions. Very few drugs since 2001 have been scientifically validated for the treatment of PTSD. To date, many practitioners have followed a course of “plug and play” for effect. This reflection is often voiced by veterans who have been prescribed dozens of medications in their pursuit to feel normal again, a life free of pain and fear. CVB’s efforts to develop an accelerated and adaptive clinical trial, leveraging precision medical approaches for treatment and evaluation could very well change our path forward for treating PTSD. CVB’s design and validation of new and current pharmaceutical options will significantly illuminate what actually works on diagnosing, managing, extinguishing, and preventing PTSD. Considering the large numbers of active duty and veterans currently diagnosed with PTSD, this challenge has significant implications both within the military enterprise and in the civilian sector where PTSD also challenges many worldwide. Cohen Veterans Bioscience’s effort to bring knowledge to government leaders and policymakers continues to have impact in advancing new agency authorizations, tasking provisions and targeted funding intended to fuel new research collaboration, information sharing, innovation and discovery. There are so many variables that make up the complex rubric allied to veterans brain health. The second and third order effects related to a veteran’s health and stability touch family, friends, teammates and community. These brave men and women voluntarily stepped up on the line to serve this great nation with the goal of protecting our freedoms and ensuring our security. Many have gone into harm’s way at personal expense and sacrifice. We cannot leave any more of them behind. It is our national obligation to support those that have come home with both visible and invisible wounds. Our effort to deal with the consequences of their honorable service cannot be at the expense of a veteran’s dignity or sense of self worth. Unfortunately, 20 veteran suicides a day has become a horribly painful metric for this nation, we have a long challenging march ahead. Which of CVB’s programs/platforms do you think will have the biggest impact on Veterans brain health? 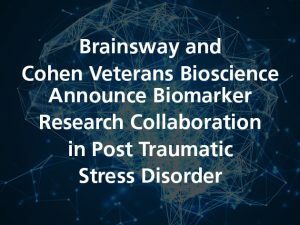 I am confident that if Cohen Veterans Bioscience can influence the development of new diagnostic imaging technology, blood marker indicators, and neuro-cognitive assessment for TBI in a living person, it will be a game changer for how we address combat related poly-trauma. We desperately need to define blast related TBI and its disease progression in our warrior population. This developmental effort, coupled with knowledge gained from companion longitudinal research on TBI, will undoubtedly lead to early diagnosis and targeted treatment for blast related brain injuries. It will clearly inform appropriate therapies, rehabilitative support and injury prevention that has a nexus to both training and combat operations. What advancements are you most looking forward to in the Veterans health space in 2019? I am very excited about energizing a large movement to vacuum data into the BRAIN Commons that I expect will illuminate connections that have not been visible to date. This cross cutting data integration and analytical effort will lead to the development of information leading to knowledge and decision support, that will further guide action and future direction. The BRAIN Commons will fuel collaboration and more research evolution that will elevate the opportunity to innovate and discover new solutions. I predict that in three to five years, we will have advanced brain health science beyond our expectations. As a result, we will be improving a meaningful post-service life experience for our veterans, reducing suicides and finding ways to prevent these destabilizing poly-trauma conditions. Frank Larkin served as the United States Senate Sergeant at Arms (SAA). As chief law enforcement and executive officer of the Senate, the SAA enforces rules of the Senate; provides a range of technical and administrative services to Senators in their Washington, DC, and state offices; and maintains security in the Capitol and Senate office buildings.